Q: The US State Department released its Country Reports on Human Rights Practices for 2016 on March 3, criticizing once again China's human rights condition in the China-related part. What is your comment on that? A: The China-related part in the US report is unfounded and full of bias. We are firmly opposed to that and have lodged solemn representations with the US side. The Chinese government attaches great importance to protecting and promoting human rights, and has scored tremendous achievements in this since the founding of new China. That is a fact that cannot be denied by anyone without political prejudice. We always maintain that countries should conduct dialogue and exchanges on human rights on the basis of equality and mutual respect for the purpose of mutual learning and joint progress. We urge the US to be objective and unbiased about China's human rights condition and stop interfering in China's domestic affairs using human rights as an excuse. Follow-up: The human rights report also singled Hong Kong and Macao out for criticism. We have noted the response by the SAR governments of Hong Kong and Macao which expressed opposition to foreign government's interference in their internal affairs. What is your comment on that? A: Since the return of Hong Kong and Macao, the principle of "one country, two systems" and the basic laws have been implemented, giving the residents of Hong Kong and Macao full access to rights and freedoms in accordance with the law. This is the undeniable fact that is well-recognized by people without prejudice. It is totally wrong for the US report to make groundless accusation against SAR affairs. The Chinese side is strongly dissatisfied with and firmly opposed to that. I want to stress once again that both Hong Kong and Macao are China's SARs whose affairs belong to China's domestic affairs, and that the US has no right to interfere. Q: Yesterday the Chinese government did not release the defense budget as had been expected. It suddenly appeared on Xinhua today. Why is that? Was the government trying to cover something up? A: Madame Fu Ying, spokeswoman of the fifth session of the 12th National People's Congress, has already given a full explanation to the question about China's military spending. I have nothing more to add. What I want to stress is that China sticks to the path of peaceful development and pursues a defense policy that is defensive in nature. Q: Early this morning, the DPRK launched four ballistic missiles. I wonder what is the response of China. And, what is China's reaction to discussions of accelerating the deployment of the THAAD missile system? A: With regard to the DPRK's launches, the Chinese side has noted the move. The relevant Security Council resolutions are explicit about the DPRK's launches with ballistic missile technologies. 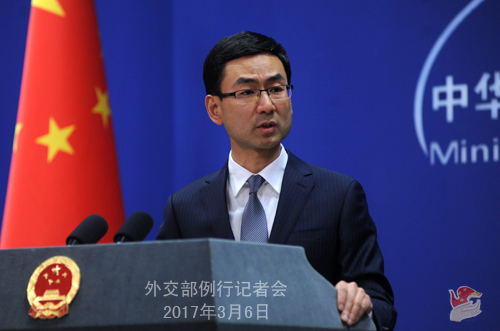 The Chinese side opposes relevant launches by the DPRK in violation of Security Council resolutions. The Chinese side has also noted the ongoing military drills between the US and the ROK targeting the DPRK. Under the current circumstances, all relevant parties should exercise restraint and refrain from any action that may provoke each other and heighten tensions in the region. As for the issue of THAAD, we have been saying that we are firmly opposed to the deployment of THAAD by the US and the ROK in the ROK. We believe that the deployment disrupts strategic balance of the region, undermines strategic and security interests of countries in the region including China, and does harm to peace and stability of the Korean Peninsula. We urge relevant parties to face squarely China's reasonable concerns, call off the deployment and avoid travelling further down the wrong path. Q: Over 20 Lotte Mart stores in China have been closed in the wake of the ROK's decision of deploying THAAD. What is your comment on that? A: As we have said before, we welcome the investment and operation of foreign companies, including those of the ROK in China, and protect their lawful rights and interests in accordance with the law, as long as their businesses abide by laws and regulations. Q: It is reported that US Secretary of State Rex Tillerson is going to visit Japan, the ROK and China this month. During his stay in China, he is said to meet with Chinese leaders and Foreign Minister Wang Yi for discussions on the Korean nuclear issue, among others. Can you confirm and give us more details? A: The Chinese side welcomes the visit by State Secretary Tillerson when both sides are convenient. China and the US stay in communication on the relevant issue. Q: Reports say that the US might have been disrupting missile launches by the DPRK using electronic interference. There was also a report that the new US Administration is considering a range of options against the DPRK including missile strikes on its missile launch sites and also the possibility of reintroducing US nuclear weapons to be based in the ROK. Do you have any comment on these reports? A: On your first question, I have not heard about that. 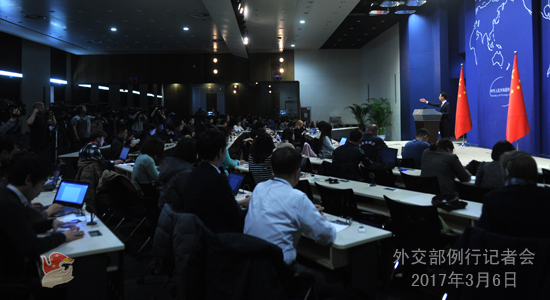 On your second question, which is about the policies of the new US administration, I want to say that the Chinese side stays true to its commitment to denuclearization, peace and stability of the Korean Peninsula, as well as the settlement of the relevant issue through dialogue and consultation. We want to restate that given the complexity and delicacy of the current situation, all relevant parties should keep calm, exercise restraint and avoid any action that may further escalate tensions. What is more, we have a rather clear position on denuclearization of the Korean Peninsula, which is to denuclearize the entire Peninsula. Q: It is learnt that the Chinese government's Special Representative on the Korean Peninsular Affairs Wu Dawei had telephone calls with his American and ROK counterparts on March 3. Please give us more details. A: On March 3, Special Representative Wu Dawei had separate phone calls with US chief negotiator Joseph Yun and ROK chief negotiator Kim Hong-kyun to the Six-Party Talks, expressing China's position and concerns on the US-ROK joint military drills and the deployment of THAAD by the US in the ROK. Wu Dawei said that the large scale military exercises between the US and the ROK do no good to the settlement of the Korean Peninsular issue, rather, they will sharpen the division and even complicate the situation. It is hoped that the US and the ROK will exercise restraint and avoid escalating the tension. Wu Dawei also emphasized China's firm opposition to the deployment of THAAD by the US in the ROK, asking the two to take seriously China's solemn concerns and properly deal with the relevant issue. Q: Taiwan announced today that the "Association of East Asian Relations" will change its name to the "Association of Taiwan-Japan Relations." What is your comment on that? A: I am not aware of the latest development. But we have expressed our position on other similar moves. The Chinese side holds a consistent and clear stance on the Taiwan question. We are resolutely opposed to any attempt to create "two Chinas" or "one China, one Taiwan". 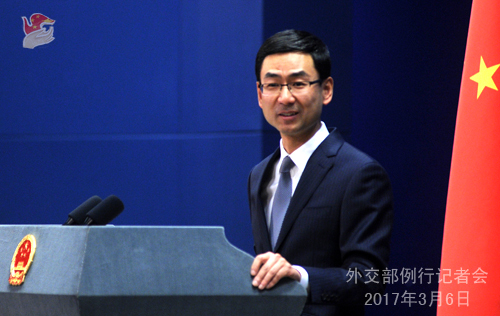 The Chinese side urges the Japanese side to honor its commitment, adhere to the one China policy and properly deal with Taiwan-related issues in accordance with the four political documents including the China-Japan Joint Statement.